Israel’s Ambassador to the UN meets Chicago Mayor Rahm Emanuel, praises Illinois's efforts against BDS. Israel’s Ambassador to the UN Danny Danon met this week with Mayor Rahm Emanuel during his visit to Chicago. Ambassador Danon also discussed with Mayor Emanuel the joint battle against the Boycott, Divestment and Sanctions (BDS) movement against Israel. “Chicago stands by Israel and Israel stands by Chicago in this important battle,” Danon said. The State of Illinois was the first American state to implement legislation against the BDS movement. 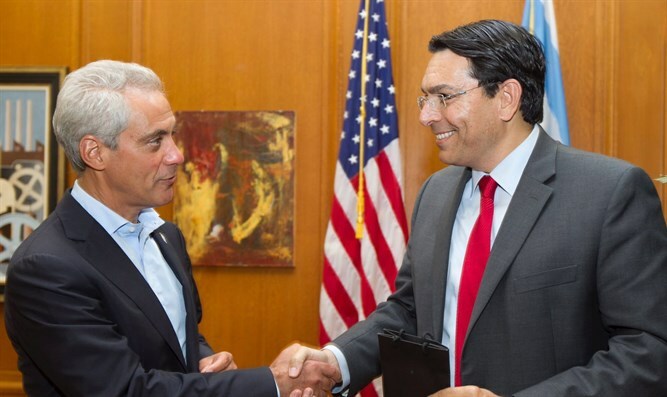 Ambassador Danon thanked Mayor Emanuel for the successful implementation of this law in Chicago and called for continued coordination and cooperation against those who seek to delegitimize Israel. Anti-BDS legislation has been picking up steam in the U.S. Just last week, New Jersey Governor Chris Christie adopted an anti-BDS bill. The bill signed by Governor Christie had passed both the State Senate and Assembly almost unanimously. The new legislation will prohibit pension fund investment in entities that call for a boycott of Israel, and mandates a special report which will be presented to the State’s legislators to guarantee that the bill is being implemented.